invites you to the Saxon 7s! The beautiful baroque city of Dresden is the backdrop for this tournament which will take place on 16th June 2007. Dresden located in the southern part of former East Germany approximately between Berlin and Prague and near both the Polish and Czech borders. The tournament will coincide with a huge street party called the “Bunte Republik Neustadt” which will be centred around Dresden’s lively Pub and Club district – the “Neustadt”. 15 men’s teams and 8 women’s teams are expected. Each of the men’s teams will play a minimum of 4 games in the three groups with a possible two extra games for the semi finals and finals. The women will play in two groups and will play 4-5 games each, including a cup and a plate semi finals and cup and plate finals. Friday evening arrival in Dresden. If the teams wish, they can visit the street party “Bunte Republik Neustadt”, that will on the whole weekend in Dresden’s Dresden’s pub district – the Neustadt (Newtown). The tournament starts at 10.00am on Saturday, a breakfast will be provided free for participating teams. The tournament and will culminate in a final, the presentation of awards and a visit to the “Bunte Republik Neustadt” or BRN for short. The BRN is a huge street party with live music, entrance is free and usually goes on until 2.00 to 3.00 in the morning. For those who still have not had enough there are pubs and clubs open around the clock. The registration deadline is the 30st April. An entrance fee to the competition of 50€ (for 1 team) or 80€ (for two teams) transferred to the below bank account will be taken as confirmation of registration. The proceeds of the tournament are to benefit our youth and children’s rugby. We would therefore be very grateful for any sponsor donations that teams might be able to bring with them! Cheap hostel accommodation is available in Dresden (see link http://www.dresden.de/index.html?node=11531), with prices starting at 12€/night for a dormitory bed. More luxurious accommodation can be found in the various hotels of Dresden. Camping next to the tournament playing fields will also be possible. Ryanair and Easyjet fly into several regional airports. The most convenient of these being Berlin Schönfeld and Prague International Airport. Other nearby airports include Dresden International Airport and Leipzig-Halle International Airport. Rail connections to Dresden from these Airports are very good. If you tell us where and when you are arriving we would be happy to give you a hand getting to the field. Food and drink will be available during the course of the contest. Please contact us is you require further info. June 30th and July 1st, 2007, our Beach Rugby event is again open for everyone who likes the perfect mix of rugby, beach, party and athmosphere. You don’t want to miss this event! Not convinced? Ask the 40 teams from Belgium, UK, The Netherlands and France who participated in the 2006 ‘Beach Rugby Festival Weekend’! auf der Sportanlage der Rugby Union Marburg. Die Rugby Union Marburg lädt alle Rugbyfreunde zum traditionellen Marburg 7´s ein. 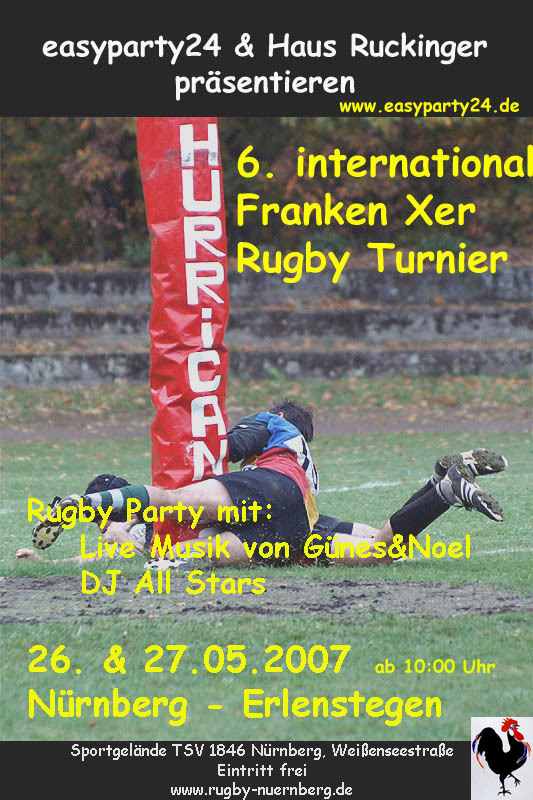 Das Turnier findet am Sa., den 26.05.Mai, auf dem Rugbyplatz der Rugby Union statt. Wer auf dem Platz nichts holen konnte, kann spätestens abends auf der Party sein Können unter Beweis stellen und sich bei der Bierstaffel den Titel als „best drinking team“ sichern. Zugelassen werden insgesamt 18 Damen- und Herrenmannschaften. Auch Einzelspieler und -spielerinnen für Wild Teams sind herzlich willkommen. Wir erwarten wieder das Team unserer Partnerstadt aus Frankreich und Gäste aus der Donaustadt Linz . Für alle die sonntagmorgens noch oder wieder wohlauf sind, gibt es ein reichhaltiges Frühstücksbuffet. Wir freuen uns auf ein tolles Rugbywochenende mit euch! Highland Games, Karaoke, Party etc. Wenn es regnet: Wir haben diese Jahr ein großes Festzelt! Auch dieses Jahr findet wieder unser legendäres Franken 10er in Nürnberg vom 25.-27.Mai statt. Und auch dieses Jahr freue ich mich Euch einladen zu dürfen. same procedure as every year: the franconien 10’s tournament will take place in Nuremberg 25.-27.may. Please let me know latest 31.march 2007 if you are coming or not.